I've been thinking lately that I would love to find more craft supplies that are environmentally friendly and/or fairly traded. Well, Child Two and I were in Ten Thousand Villages recently and we saw these packages of skeletal leaves, from Salay Handmade Paper Industries, that are made by women in the Philippines who are paid a fair price for their work. 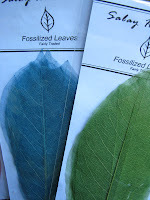 I've seen these types of leaves in craft stores, but not fair-trade ones. It's hard to tell just what they look like from these stunning photos (it's not easy to take pictures of a stack of paper-thin leaves in a plastic envelope on a sunny day). They're very, very thin and you can see all the veins in the leaves. They're used in collages, scrapbooking, cardmaking, and decoupage (on the second page of Salay's "gifts and novelties" section, there's a picture frame decorated with them). The guy who sold them to me told me about a woman who made a mobile out of them. 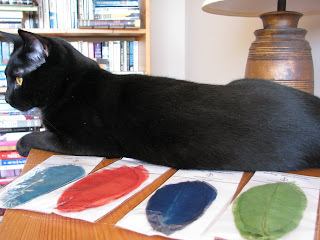 I have four packages: green, dark blue, teal blue, and red. It looks like there are eight or ten leaves in each package. If you'd like to win a package, leave a comment here. If there's one color you desperately want, please say so. I'll leave this contest open for a week or so and then draw one or more winners randomly and contact them for their addresses. This is open to anyone, anywhere. Cat not included. First, I noticed your cat is very similiar to our Herb. Is yours a Bombay? Those leaves are very cool. 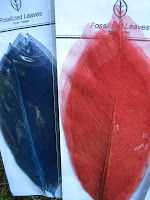 I would love to win a set of leaves. I love the color green, so I would love to win the green ones. What an adorable, fairly traded find! They would be gorgeous decoupaged, or added to this mobile I found on Flickr! Thanks for the comment in my blog! I have gotten one or two skeleton leaves in a swap once and I'd love me some more to experiment with in my art! Not blue but any other color, if I get picked. SO much fun, thanks for being generous! About the cat . . . I don't know what his breed is. We adopted him from the animal shelter. He had a few brothers and sisters there with him. His name is Jamie, also knows as Jamie McTrouble and Calamity James. He's a troublemaker through and through (especially in the middle of the night) and a menace to plants everywhere. He's also quite the scaredy cat and loves to carry knitting needles and paintbrushes around the house. I'm sure my husband wouldn't mind if I accidentally stuffed Jamie in the envelope along with the leaves. The skeleton leaves are gorgeous colored. That is so neat! I've seen these in craft stores too, but had no idea about fair trade for them. The teal blue & green are my favorite. Those are nice. I make/stamp cards. Any color will do for me. Thanks for stopping by my WW last week and leaving a comment! The leaves are awesome(and so are you!). Green or red will be excellent. So beautiful! I like the cat,too!